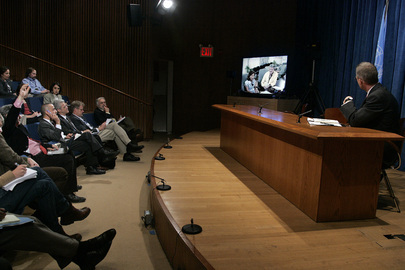 UNITED NATIONS, February 8 -- Forty days into 2010, a self-described "United States official" gave a background briefing to select UN correspondents about the achievements of the U.S. at the UN in 2009, and its priorities for 2010. In the half an hour session, there was no mention of the word "Darfur," or even Sudan or any country in sub-Saharan Africa. Were the region's problems all solved in 2009, or are achievements hard to come by? The US official emphasized two 2010 priorities -- Iran and Haiti -- and spoke proudly of President Barack Obama's day presiding over the UN Security Council. The official argued, when asked, that recent criticism of the Administration's performance at the UN in 2009 came only from those who do not like engagement or the year's achievements. 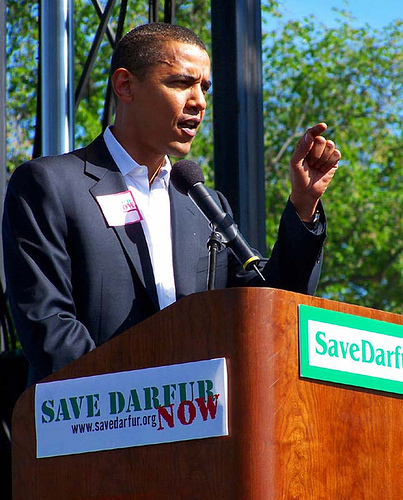 The Save Darfur Coalition, following President Obama's State of the Union speech last month, issued a press release expressing disappointment that Darfur had not been mentioned, contrary they said to the Obama campaign's statements before getting elected. This is not merely word- or bean-counting. The trend of speaking less about Darfur has extended from the US Mission to the United Nations itself, as Inner City Press has reported on, here. In context, the US official's failure to mention Darfur even in opening remarks to UN correspondents was surprising, news and note-worthy. NGOs like the Enough Project and Global Witness speak about the impact on civilians in the Democratic Republic of the Congo and elsewhere from the unregulated exploitation of natural resources, by rebel groups and even units recently integrated into the Army with which the UN Mission, MONUC, works. The US official, in half an hour including 11 questions, did not mention the Congo, or resource exploitation. Nor were Asian human rights issues like Myanmar and the war crimes in Sri Lanka mentioned. During 2009, Sri Lanka was blocked from the Council's agenda by China and Russia, which just lent Sri Lanka $300 million to buy more weapons. At the UN, the US said very little about this as tens of thousands of Sri Lankan civilians were killed in 2009. And Monday it was not mentioned by the US official. While the US Mission controls who to invite and who to call on, after the session a rosy reporter who was called on agreed that no sub Saharan Africa issue was mentioned, but blamed it equally on the press corp. Only Western Sahara and Polisario were raised, he said. Not Sudan, nor the Congo, Zimbabwe or even Somalia. Others, including Inner City Press, noticed the lack of claims, much less questions, about trying to root out corruption and mismanagement and abuse in the UN. The US used to be the only country doing this, and now it has stopped. For example, the head of the UN's mission in the Congo, Alan Doss, has supposedly been getting investigated for eight months now about a six line e-mail in which he asked the UN Development Program to "show leeway" and give his daughter a job. No accountability, and not a word from the US Mission. Likewise a recent decision harshly criticizing the performance of another UN Under Secretary General, Shaaban Shaaban. The UN's own Dispute Tribunal has ordered the UN to pay $20,000 -- perhaps by Shaaban personally -- but the Ban Ki-moon administration has simply said it will appeal. No word from the US Mission. The US official said that the new team doesn't disagree just for the sake of disagreeing. But on issues ranging from Darfur to anti-corruption in the UN, what were the accomplishments or even attempts in 2009? Contrary to what the US official said, the critique is not only from the right. The seeming lack of focus, and more importantly accomplishment, on Darfur, Congo and Somalia, is a concern that is growing from the Left as well. Watch this site. UNITED NATIONS, January 22 -- Nigerian Foreign Minister Chief Ojo Maduekwe brought a $1.5 million check for Haiti to the UN's Ban Ki-moon in New York on Friday. Afterwards Inner City Press asked him about Nigeria's previous bilateral grant of $500,000 to the military government in Myanmar, months after Cyclone Nargis hit that country. What had changed Nigeria's policy, and what follow up had there been on the Myanmar regime's use of the $500,000? Video here, from Minute 6:22. Ojo Maduekwe said the money had gone straight to Myanmar's government so as to be a "speedy response." But it was months after the cyclone. Here, Ojo Maduekwe here, the Secretary General made a flash appeal. But that was also true in Myanmar. Click here for Inner City Press' first, exclusive story. Ojo Maduekwe said, "it's not that what we did last time was wrong, just that we're improving." Inner City Press asked if the Minister had spoken with his President at all during the weeks he has been in Saudi Arabia for medical treatment. Video here, from Minute 5:35. Ojo Maduekwe said no, he had not been able to speak with the President, but he feels he is carrying out his policies. Later on Friday, as Inner City Press moderated a second session of Ojo Maduekwe with reporters, Omoyele Sowore asked how Ojo Maduekwe could thus claim to have a mandate, adding that he had supported Sani Abacha. Ojo Maduekwe called the question disrespectful and said he would not answer it. But see video here. Inner City Press, as moderator, re-phased the question, and asked Ojo Maduekwe to answer. He did, at length, arguing that while picked by the President, he represents his region, and the Federal Government of Nigeria. Not allowed was this question: if Sudan's Omar al Bashir visited, who would decided to enforce the International Criminal Court warrant or not? 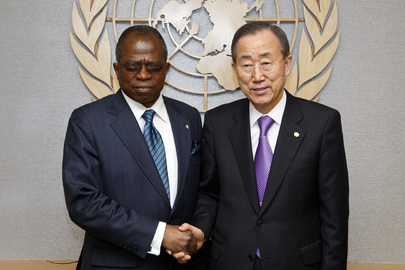 Inner City Press asked Ojo Maduekwe if he had discussed with Ban Ki-moon the violence at Jos, and the plight of Nigerians in the Bakassi Peninsula. Ojo Maduekwe said that the crackdown in Jos showed that mediation by the government is over, now it is about law, order and punishment. Citing the reported extra judicial execution of the leader of Boko Haram (No Western Education), Inner City Press asked if any human rights investigation had been done. "Same answer," Ojo Maduekwe said, adding, "due process." On Bakassi, he praised Cameroon's president's response and said he would be meetin with him next week. But what about the UN's role? The question was asked recently by the Press at a UN noon briefing, but never answered. Footnote: Inner City Press also asked Ojo Maduekwe about the back parking tickets and real estate taxes the Nigerian Mission and diplomats in New York own, click here for Inner City Press' previous story. Ojo Maduekwe on camera said his Permanent Representative Ms. Joy Ogwu would briefing him and Nigeria will "do what is right" after "I take administrative action." Video here, from Minute 8:41. Later on Monday he called it an administrative matter and referred another reporter to the Mission, where they channel the questions to their lawyer. What was that again, about doing what is right? Watch this site. In front of the Nigerian Misssion on Friday morning was a protest, of the "missing" President. "If you see him, call 1-800," a toll free number, one sign said. Next door on 44th and 2nd is a soup cart run by Azim of Afghanistan, with tasty lamb and lentil soup for four dollars, bread included. If Azim pays his taxes in the City of New York, why can't Nigeria?